Hello, Blog-land! I haven’t written anything in quite a long time. So it goes, I’m not much of a blogger. I know this site is supposed to be about cakes, but I made some special cookies this year for Christmas and I thought that I would share my experience and everything you need to make sugar cookies. First, you need a good recipe. 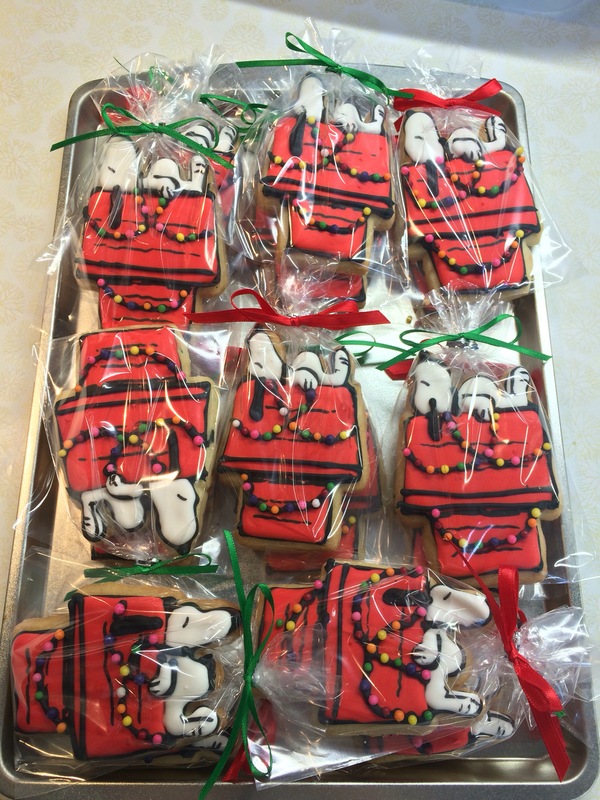 Here are two sugar cookie recipes I love. This year, I used the King Arthur recipe for the first time and it’s awesome! I used the weights in ounces to make my cookies, but I’m sure it’s equally great if you measure by volume. I baked my cookies and put them in the freezer until I had time to decorate them. You may be wondering, where did I get that cutter? Well, I didn’t get it in stores because they don’t make them. I wish they did! I got it on Etsy. I used a royal icing recipe by Sweetopia. It’s by far the best royal icing recipe I’ve used. That’s not saying a lot, since I’ve only used this and the Wilton recipe for egg-white royal icing. This recipe calls for meringue powder, which I bought at JoAnn Fabrics with a 60% off coupon. Do that! It is so expensive. I usually buy expensive baking supplies at Michael’s Arts and Crafts or JoAnn’s when they have great coupons. I tested my icing using her great 10-second test and had to add more water to get it the right consistency. My icing was so thick! I added more water 1 teaspoon at a time. The recipe calls for clear vanilla, but I don’t own that, and never will. I used my regular vanilla. 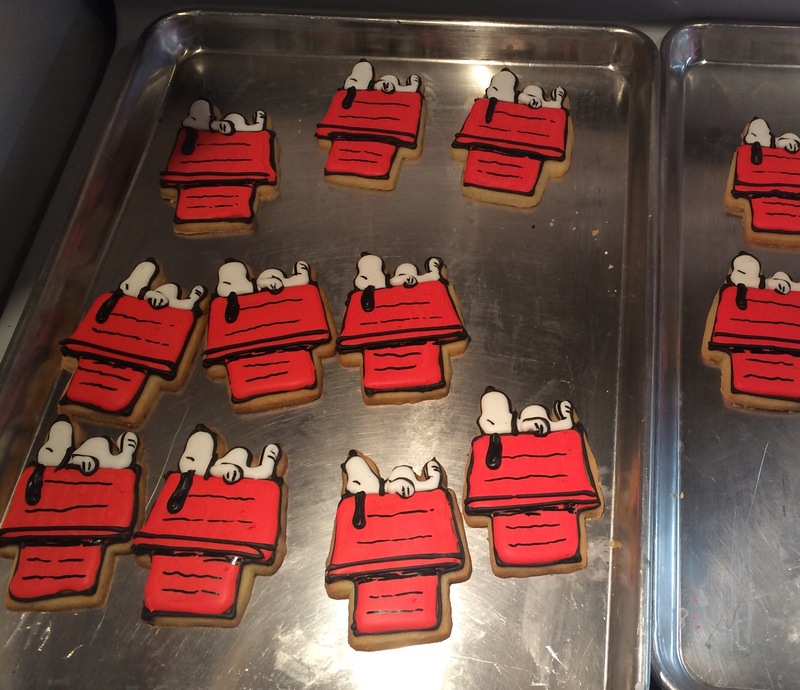 It only made Snoopy slightly off-white. You honestly can’t tell! Once you have cookies baked and royal icing made, you’re ready for the fun part. First, of course, I baked my cookies. I made them nice and thick. Two of them broke and I had to eat them. I whipped up my royal icing. Be sure to sift your sugar! If you don’t, a clump can get stuck in your icing tip. After my icing was done mixing for TEN MINUTES (I know, seems like a while), I had to add a couple teaspoons of water to make sure it was usable. It was way too thick. But after doing the 10-second test a couple of times, it was ready. The 10-second test is taking a butter knife and making a line through your icing. If the line disappears within 10 seconds, then your icing is ready. If it stays, then add more water, whip, and try again. I placed a couple of cups of icing in two bowls, reserving some white for Snoopy. I dyed them black and red. I was careful not to make it TOO dark because I knew they would deepen. Using a number 3 tip, I made the outline of the house and of Snoopy, using a picture as a reference. While I was making Snoopy’s outline, I also made his nose. After I was done the second tray, the first tray was dry enough to start flooding with red royal icing. I used a number 5 tip, which is not too big, but not too small. You start on the outside perimeter, work your way in. Then you scrub your cookie back and forth on the tray and the lines disappear. It is really fun! 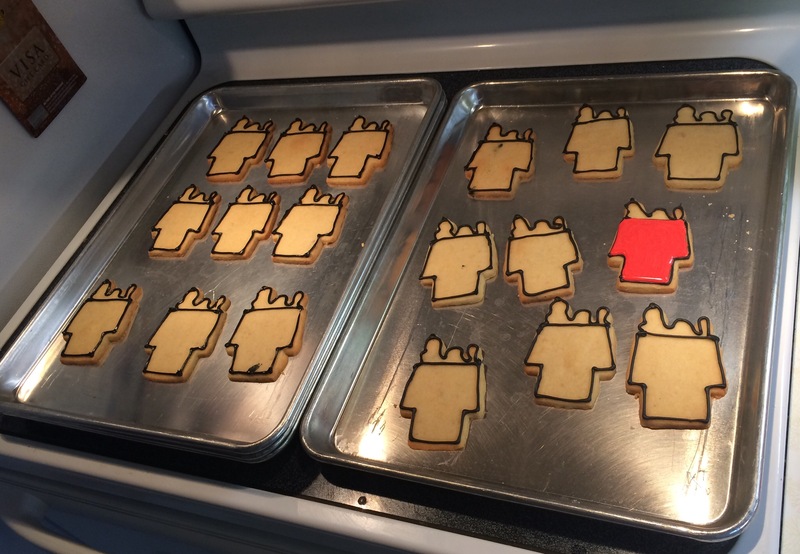 I then filled in all the red houses of every cookie. 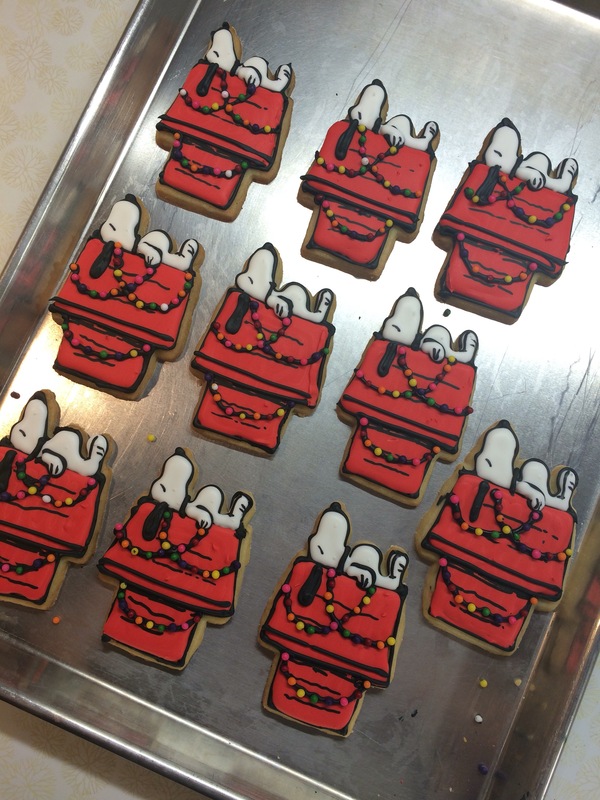 Then, after I was done the second tray of houses, I went back to the first tray to fill in Snoopy with un-dyed icing. I used a number 5 for this, too. Snoopy is tiny, so this went quickly. 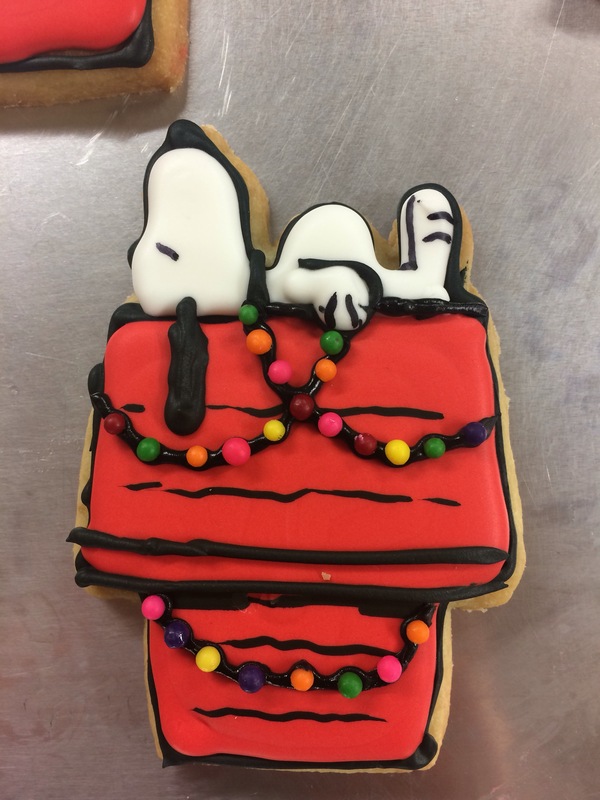 After about a half hour, the red and white icing had dried enough to add arms, another black line of detail, and Snoopy’s collar. I drew all this with the black icing. Then I went back with my white and filled in his arm. His arm hangs off of the top of the doghouse slightly. Another half hour after that, I added Snoopy’s ears, which cutely hang off the side of the house, just like his arm. Then, using my AmeriColor edible marker, I added the shadow under the top of the house, the wood paneling lines, his eyes, his feet and his paw lines. After that, I had to wait until after dinner and bed time to add the Christmas lights. I knew this would be time consuming. To make sure my black icing would not harden, I put my pastry bag in a Ziplock bag. Then, I poured some of my nonpareils into a bowl and got to work. Adding the lights was tedious and lasted about an hour. Eek. That was probably my least favorite part. But look at the results! It was totally worth it. By that time it was 9:30 PM at night, and I was tired, so I let them dry on the counter overnight. The next day, I bagged my cookies in treat bags (found at Michael’s), closed them with the twist-ties that are included, then added a green or red bow to each one. This project was easier than I thought it was going to be, but took just as much time as I had anticipated. BUT I did something that I had been thinking about all year (I saw it on either Facebook or Pinterest last year), and I have a beautiful little treat for our parents and the kids.